A synapse is a junction between an axon terminal of one neuron and the dendrites/cell body of the next neuron. Generally, synapses are between the axon ending of one neuron and the dendrites and cell bodies of the next neurons and are known as axodendritic synapses. There are two different types of synapses: electrical and chemical. These synapses are found in all nervous systems, including the brain. This is where the membranes of the two neurons which are communicating come very close together at the junction and are linked together by an intracellular process called the gap junction. The junction contains paired protein channels of the junction and each channel pair forms a pore. As the pore of a channel is larger than the pore of a gated ion channel, a very low resistance pathway is therefore formed and ions can diffuse and flow directly from one neuron to the next. Transmission across the synapses via electrical communication is very fast. Chemical synapses are released and received by neurotransmitters which open and close different ion channels that influence the permeability of the membrane and therefore, the membrane potential. Neurotransmitters are chemicals which relay information or messages to carry a signal across a synapse which are stored in sac like structures at the end of an axon. When the nerve impulse reaches the end of the axon, the sac/vesicle releases a neurotransmitter into the synapse. These neurotransmitters diffuse across the synapse and bind to the receptors in the next cell. Neurotransmitters change the permeability of the cell membrane to different sodium and potassium ions. 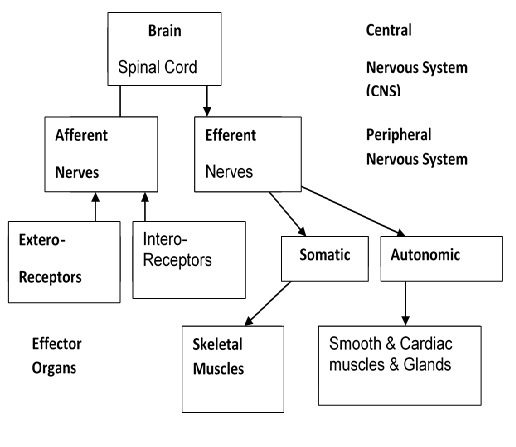 This assists to set up the action potential and transmit the next impulse across to the adjacent neuron. Neurotransmitters can be stimulated or blocked by different drugs or toxins that may be taken. Neurons are organised into billions of networks which are known as the neural circuit. The human nervous system consists of billions of nerve cells - or neurons, plus supporting - neuroglial cells. Neurons are able to respond to stimuli such as touch, sound, light, and so on, conduct impulses, and communicate with each other and with other types of cells like muscle cells. The nucleus of a neuron is located in the cell body. Motor skills includes such things as locomotion - running, walking, leaping, climbing, manipulation - throwing, kicking, catching, bouncing, and stability - bending, twisting, rolling, dodging. Mastery of a range of motor skills, combined with good overall physical fitness, is critical to the healthy development of any adult or child and forms the basis athletic competence.